Have you ever set eyes upon a cashew tree? Until our trip to Crooked Tree Lodge and Sanctuary last week, I had not. What an interesting sight, with its inside out fruit! Mike and I often complain about the price for cashews, one of our favorite nuts.Last week we learned about the cashew's preparation process, so now we're much more appreciative every time we pop one of those healthy, toasty treats into our mouth. 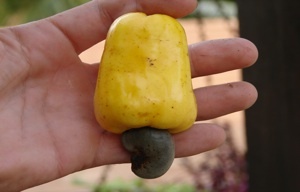 A cashew is actually the seed of the cashew fruit. It is indeed odd in appearance. You can see in the picture that the seed actually grows outside of the fruit. There is only one seed/nut for each fruit. The fruit is a bit larger than an apricot, and of a similar, bright yellow color. It's easy to pick out a cashew tree from a distance. Their eye catching, brightly colored fruit, with external, hanging seed pods are hard to miss. The fruit is so odd you can't help but do a double take. 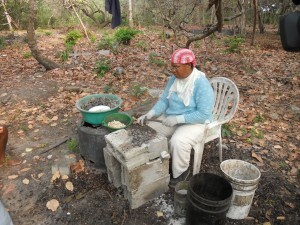 While on our bird watching tour, we had spotted a Creole woman sitting at a small table in her yard, with a mallet. She was patiently cracking the outer shells off cashews. We asked, and she generously allowed us to take pictures while she explained the cashew preparation process. Cleaning and roasting cashews is an involved process. The natural surface of the seed is actually toxic. So it's advisable to wear gloves while cleaning them. Otherwise, you'll most likely end up with blistered skin. The seed is then washed and roasted. Afterwards the hard outer shell is cracked with a small mallet, to remove it. Once again the nut is roasted and cleaned. So a series of steps are required before the cashew achieves its full, tasty potential. We regularly buy cashews in San Pedro. Local vendors package them up and sell them in a variety of sizes, on the beach. But we tend to cringe at the price. But in Crooked Tree they are quite cheap, at $10 US/quart. These are the most delicious cashews we've ever tasted. They were roasted, with no additives at all. This is a healthy treat. No oil, no salt. Just the wonderful natural sweetness of the roasted nut. Each of us bought as much as we could, to take back with us. Back at the lodge, the afternoon before, we had watched a similar process. 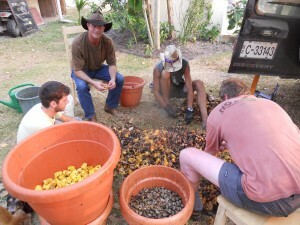 The lodge owner, Mitch, and his buddy separated the cashews from the fruit and washed them. But they had a different goal in mind... Mitch was in the middle of making cashew wine. We couldn't help but notice the pungent smell of the sweet cashew fruit fermenting. Now I'll admit that I don't favor sweet wines, but I had to give it a try. Cashew wine is too sweet for my palate. But it would make an interesting aperitif for those who like port or other sweet aperitifs. Or it would be a fun and unusual gift to bring back for Aunt Martha. I'd rather not experience a cashew wine hangover, though. Unfortunately, we missed the Crooked Tree Cashew Festival. It was held the weekend before we arrived. Our trip had been a last minute diversion. The festival is held each year on the first weekend of May. So if you decide to visit Crooked Tree, you might enjoy coming for the cashew festival. The weather is usually dry and warm in May. The colorful regional and migrating birds are everywhere to be seen. And the bountiful cashew, flamboyant and frangipani trees are showing off their spring finery - of vivid, vibrantly colored red, pink, and orange blossoms.